For the past three months, I have been working tirelessly on a 4000 word report, that explores the evocative natures of Vinyl Records and how they create an experience for the listener. This was intensive and a lot of research was needed to compile into a report and a visual response. The aim originally was to look at album covers, and how they have created an experience but with much discussion and self directed study, it became to looking at the records and the covers as a whole, in how and why they are evocative and culturally popular. This was enlightening and really interesting to read up on, seeing as how vinyl records are now becoming popular again. They’re a old format, but new to the generations today. I am extremely pleased with my outcome, a 12″ x 12″ book titled ‘Going Round in Circles’, which includes self produced photography, letterpress, interview and quotes from my research. I have also included a mini 7″ x 7″ book, featuring my interview with one of my course mates, and friend, Dan Bass. Another feature to this book as a double sided A2 poster, with letterpress type expressing a word visually, with the images. I want to share this outcome to show how proud I am, of what I have managed to achieve in three months!!! Yesterday on of my best friends (that sound slightly childish, but she is a fantastic friend kind of like a sister but not blood related) anyway, she asked if I could look after her magnificent budgie Frederick III for a week. Surprisingly my grandparents said yes which I wasn’t expecting. I am eagerly awaiting his arrival and while I am waiting, I thought I haven’t blogged in a while, but also that this blog of mine hasn’t really been about graphic design, only a few bits of animation here and there. SOOOOOO recently I have been making a website for my local stables and it has taken longer than it should (god that doesn’t put me in an efficient or good light, which could go against me ……) It is almost finished, just got a few bits to do…….like image copyrighting……………a whole page to finish…………..another couple of pages to edit…………………etc etc etc. But when I haven’t been doing the website I have randomly decided to get back into spontaneous doodling, I have been inspired for some reason to doodle possible outcomes for tattoo designs……. but my one so far is this charming design. I love music, it is a way of life for me. I just have this ominous feeling when I listen to music that no one can distract me from listening to the souls of other people. This is a similar feeling when I read a novel. I feel the emotions of each character like I feel the emotions of each singer or song writer in a certain song. 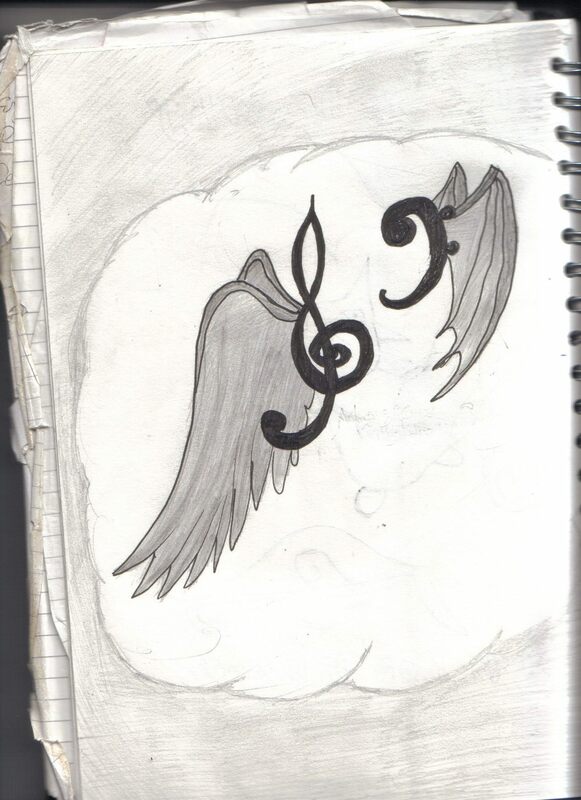 The wings are representing the way my mind floats from happy thoughts to dark thoughts etc. I know they have different meanings in the tattoo world, but I am a free spirit, that can’t be contained in a box or a tight space other wise there will be explosions. I am talking metaphorically, but those that know me, or have met me will know that in fact I am a passionate person that loves anything to do with books, music, good design, and just general amazing weird generic things. Back to my main point of this, Fred will be here later on in the day where I may do another blog with an image of him if I remember to do so.